Home » End of horrible period. Share the post "End of horrible period." “Immediately, I made an appointment with my doctor to get a myomectomy. He had already given me birth control pills and a Depo Provera shot (which had negative effects for me) and this was his final option besides a hysterectomy. He told me, “Your fibroids will grow back in about 6 months but you’ll definitely see a decrease in the flow of your menstrual cycle.” The procedure included a 4 day 3 night stay at a hospital. There was severe pain after the surgery and soreness during the 3 month healing process. However, I was pleased with the results because my periods were no longer heavy. One day, I noticed my cycle had become irregular again. I hadn’t noticed but it had indeed been six years since my operation. My job at that time would not allow for me to be out 3 months nor was I looking forward to the recovery process of major surgery. So, I got second opinions from various doctors; most recommending the same myomectomy procedure. 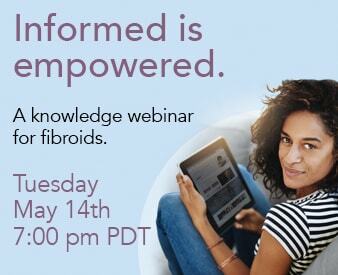 It was through my research on the web that I found Dr. Bruce McLucas at Fibroids.com. I lived out of the state at the time so I made an appointment to drive to LA to meet with him. After meeting Dr. McLucas and seeing how knowledgable he was on the subject, I decided to have uterine fibroid embolization. I chose a reasonably priced hotel that was between the airport and the doctor’s office. It was a two day procedure. The first day was completely painless and merely a chance for the doctor to scope the area. The second day was the actual embolization procedure. Under a twilight sleep, there was a slight feeling of discomfort but no real pain during the procedure. Later in the evening, there was heavy cramping but after taking my prescription, it eventually subsided.